Fly to the Antarctic and sail on our 12-passenger ship to experience islands along the Antarctic Peninsula rich with wildlife and only ever visited by a handful of people. Led by exceptionally experienced and knowledgeable expedition guides and crew, you will travel among curious penguins, whales, and mountainous scenery during 14 full landing days. You will benefit from the ease and flexibility of getting such a small number of travelers ashore. Conditions permitting, we will focus on areas completely outside the range of larger tour vessels, such as the newly discovered Adelie penguin super-colony on the secluded Danger Islands. This archipelago is home to over 1.5 million penguins! Your time in nature will be unrivaled as you explore in quiet serenity. You’ll also avoid the southbound Drake Passage crossing that has for so long challenged operations of small vessels. This expedition offers a great depth of exploration and unsurpassed experiences for an intimate group, while enriching your understanding of the Antarctic ecosystem through substantial participatory citizen science. 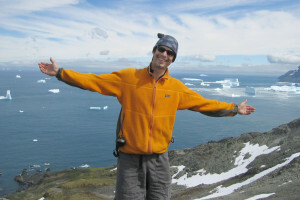 • Fly to Antarctica over the Drake Passage, saving three days of ship travel. • Conditions permitting, visit the recently discovered Danger Islands Adelie penguin super-colony. • Enjoy the flexibility and serenity of being aboard a 12-passenger vessel, during 14 full landing days. Begin your journey early on our Falkland Islands safari from January 23 to February 9, 2020. Visit six different islands, the best of Patagonia and Antarctica combined into one, to see penguins, albatross, seals and more. Trek through the most diverse wildlife habitats in the Falkland Islands (Islas Malvinas). Feb 8 Travel from our Falkland Islands safari or from home. Tom has a passion for wildlife in extreme environments and is working hard to conserve them in a changing world. His PhD involved tracking macaroni penguins to understand penguin foraging behavior. Since then, he expanded into genetics and image analysis to monitor wildlife in remote places. 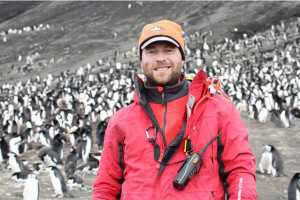 He runs the Penguin Lifelines project at Oxford University through which he seeks to understand changes in Antarctic wildlife using time-lapse cameras, volunteer photos, and population genetics to effectively create protected areas and manage fisheries. Travel to Punta Arenas from our Falkland Islands safari for an overnight (not included), or travel from home. You will sail across the Bransfield Straight to reach one of Antarctica’s hidden gems, the Danger Islands, if ice and weather allow access. These intense jagged islands were largely unexplored until very recently when researchers used satellite imagery to spot what resembled the traces of a penguin colony. Upon landing on the danger islands in 2015 to confirm their findings, researchers were shocked to find hundreds of thousands of Adelie penguins breeding, one of Antarctica’s most important Adelie penguin breeding sites. You will be among the very few to ever set foot on these islands that are teeming with life! You’ll then travel south along the picturesque Danco Coast on the west coast of Graham Land, which has awe-inspiring scenery with coastlines deeply indented with bays. Impressive mountains rise sharply from the Chinstrap Penguin coast to the central Graham Land Plateau and glaciers descend to narrow piedmont ice shelves. Extensive Zodiac cruising and opportunistic landings during the best light will allow us to soak in the serenity of this majestic place. Even with the extended time our voyage will allow along the Antarctic Peninsula, it will no doubt still feel too soon to leave the continent behind. As we sail north on the homeward leg, we will share delightful memories of our experiences, enjoy a group slide show of images captured, and talk of plans for future travels. The wildlife, however, is not all behind us. Almost 500 miles north of the South Shetlands, near Cape Horn, the waters here at the tip of the South American continental shelf are as rich as seawaters can be and seabirds are sometimes present in large flocks, especially Sooty Shearwaters if the sea is calm. Peale’s Dolphins and other marine mammals may also be seen. Once in the lee of Cape Horn, any ocean swell will disappear, and we will enter the Beagle Channel for a final scenic cruise to Puerto Williams. You will dock at Puerto Williams, Chile by early morning. After breakfast, you will disembark the Hans Hansson and spend the night in Puerto Williams, Chile. Spend your last morning in Puerto Williams, and then our local agent will transfer you from the hotel to the airport for your flight to Punta Arenas where you will connect homewards. We reserve the right to charge for cost increases that occur between when we set tour prices and the date of travel, for example, changes due to the cost of lodging and transportation. If you are a single traveler and you desire, we will find a roommate for you. If we cannot find you a roommate, we will not charge you a single supplement. If space is available, one twin shared cabin can be booked for a single occupant by adding 30% over the listed cabin cost. Single rooms are subject to availability. Charter flight on February 10 between Punta Arenas, Chile and King George Island, South Shetland Islands. Accommodations (double occupancy) in Punta Arenas and in Puerto Williams for the nights of February 9 and February 28, respectively. 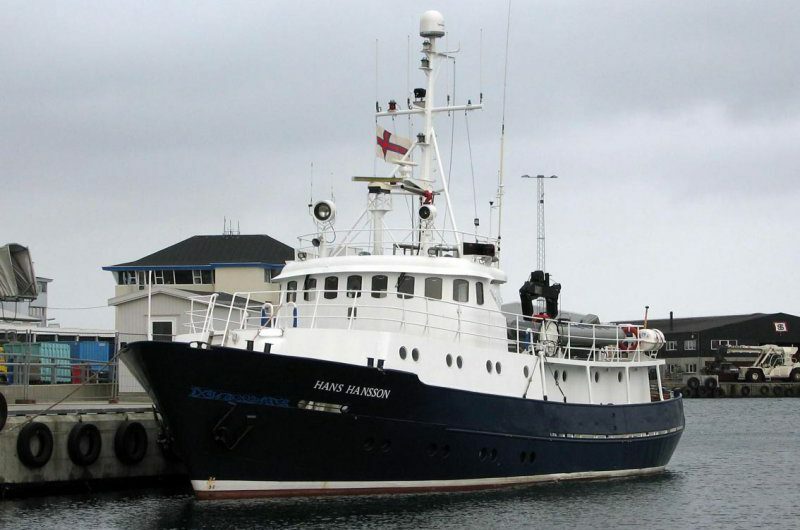 Eighteen nights on board the Hans Hansson. Meals from breakfast on February 10 through breakfast on February 29. Airport transfers to Hotel Jose Nogueira regardless of arrival day, transfers to Punta Arenas airport for the charter flight on February 10, transfers to Lakutaia Lodgeon February 28, and transfers to Puerto Williams airport for the flight on February 29. Rubber boots on loan while onboard the Hans Hansson. All airfare (except flights listed as included), airport and departure taxes, and excess baggage fees. Airfare is approximately $1,300–$2,000 round trip from the USA to Punta Arenas, Chile, depending on origin, plus about $130 for flight from Puerto Williams to Punta Arenas. Gratuities for the ship’s crew. Tipping is, of course, discretionary, however we suggest budgeting $10 to $15 per participant per day for February 10 to February 28 aboard the Hans Hansson ($190 to $285 total per participant). In Punta Arenas and Puerto Williams in February, the average temperature is around 48°F and it can be very windy. Weather can change quickly in this region and it is not unusual to have three seasons in one day with rain, hail, and accompanying wind, so be prepared. Flights you (or a travel agent) book: Arrive in Punta Arenas, Chile (PUQ) by 12:00pm on February 9. If you are arriving from our Falkland Islands safari, see the Flights section in its itinerary for arrival information. Depart from Punta Arenas, Chile (PUQ) after 2:00pm on February 29. Flights we book for you: The charter flight between Punta Arenas and King George Island. The cost of this booking is included in the tour cost. The flight from Puerto Williams to Punta Arenas. We’ll add the cost of this booking to your final trip balance. In addition to travelling to unique, amazing, and remote destinations, our voyage advances the scientific understanding of ecosystems we care about. Dr. Tom Hart, of the University of Oxford, will join our expedition to collect samples, make observations, and record data to help contribute to his ongoing research. You can see his work close up as he establishes and services remote field cameras that remain in place year-round. These cameras, deployed extensively in the Antarctic, South Georgia Island, the South Sandwich Islands, and the Arctic, are very effective at revealing unexpected patterns in seabird breeding biology, such as penguins visiting their otherwise abandoned colonies in the middle of winter. Why do they do this? Join us and learn from Tom! In addition, active research will be conducted on board to help contribute to the ongoing Citizen Science Projects – FjordPhyto and Happywhale. Don’t let a fear of seasickness scare you away! Over the years many who have dreamed of experiencing Antarctica with us have stayed home for fear of seasickness, but of all those who have joined, we know of only one passenger who said that seasickness really affected the enjoyment of the trip. Still, that same passenger talked about repeating the trip, because the rest of the experiences more than made up for it. For all but the most sensitive, motion sickness is only a problem during the open ocean passages. While we are cruising close to land – the majority of the trip – seas are usually quite calm. The Southern Ocean has a reputation for the worst seas in the world, not because conditions are always rough (on the average day, the seas are actually quite calm!) but because the extremes are large. If we are hit by a storm during our return and only Drake crossing, the experience will be memorable. For this reason, unless you know you are immovable by the heavy seas, bring a good supply of medication. Many of our frequent travelers are quite susceptible to seasickness, yet they come back year after year because they love Antarctica! Read our suggestions for coping with seasickness and contact us if you have any concerns.